Another interesting coincidence is that 1 + 2 + 3 + 4 + 5 + 6 + 7 = 28, which is the number of days it takes for the moon to make a full rotation around the earth (and itself too, in other words, 28 Earth days is one Moon day). 7 is a key number of intersection in all these values and seems to have special importance. No wonder we have 7 days in a week! Incidentally, 7 is the number associated with heaven. I find the association of 7 with the Chariot to be interesting too, especially given the very literal associations with the Earth and Moon as bodies moving through space. All this is outlined in the first few chapters of the aforementioned book, which goes on to explain that a very specific correlation between the numbers 7 and 12 has had significance from the earliest recorded histories. This numerical correlation, as well as the relative proportions of the Earth and Moon are all encapsulated in a diagram known as the Heavenly City. In it’s most simple form, the Heavenly City is made up of a central circle and 12 outer circles in the 11:3 ratio—which is the ratio of relative sizes between the Earth and the Moon (i.e. 3,960/1,080 = 11/3). The diagram looks like the example on the right. This pattern, became the basis of the inner composition of Shamanic Supernova, because of how it portrays the proportions of the Earth and the Moon, but also because of its long history of iconography. The key element to the diagram is the portrayal of both the squared circle or circle squared. One is a square and circle with equal measure lengths (i.e. circle diameter = side length of square), the other is a square and circle with equal perimeters (i.e. perimeter of square = perimeter of the circle). Both are seen in the Heavenly City diagram. To see them, first find the square, then find the circle fitting just inside the square. Then find the circle just larger than the square, which intersects the square in the corners and also forms the center line for all 12 of the smaller circles outside the inner circle (hope that made sense…). Incidentally, the ratio of the inner circle to the outer circle is 11:14, which is also the ratio of the diameter of the Earth to the diameters of the Earth and Moon summed. 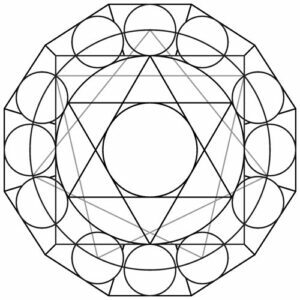 But the proportion between the square and the circle is a fundamental principle in sacred geometry, especially because it defines the two universal ratios of Pi and Phi. As such, the squared circle has been a major topic of discovery and understanding for centuries, if not much longer! Despite being tied very literally to the Earth with the Heavenly City reference, Shamanic Supernova is ultimately about Time. To add to that, it’s more specifically about the cyclical nature of time. The Native American Shamanic reference is a reference to the Shamanic Power—which can be understood as the ability to transcend (or have power over) time, the ability to see the future, and the past, and the ability to commune with spirit guides that work outside the constraints of time. Whether deep in the jungles of the Amazon, high in the mountains of Tibet, or kneeling at the Great Wall at the Dome of the Rock, I would guess one’s spiritual preoccupation is the same. It’s a preoccupation with the transience of mortality and of the passing of time. And a longing for the knowledge of the future. This is one of the the true quandaries of the human experience—being trapped by time and therefore unable to get a personal perspective on time. 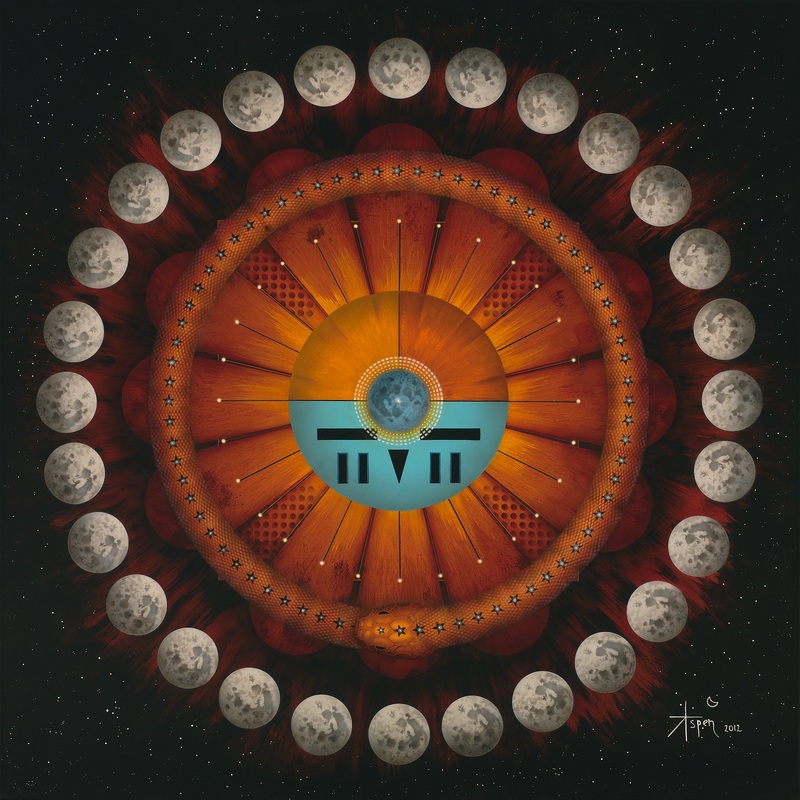 In addition to the Shamanic references, this painting can act as a literal calendar which marks the seconds, minutes, days, months, years, ages, and zodiac divisions that make up a 25,920 year cycle we call the procession of the equinoxes. Lunar cycles are also represented, with the 28/29 days of the moon cycle, with an occasional blue moon, which is also relative to the frequency in which the shamanic process unfolds. Blue is also the color of the third eye, where the Shaman has the vision. You’ll find the numbers 12, 28, 60, 72, and 360 (5 x 72) are represented to mark the milestones of time—from a single second to the twelve 2,160 year periods that make up our zodiac ages. It would take a long time (and maybe a separate sheet a paper), but you could count the seconds for the entire 25,920 year cycle right on the painting. The oroborus is a reminder that you eventually make your way back to where you started… For numerology geeks, I’ve subtly thrown in references to 33 (as in 33 octaves above 7.8 Hz base frequency, and a whole lot more) and Phi too. See if you can find them! Yet another brilliant work, brother… you are definitely tapping in to something wondrous! Looking forward to more from you in 2013 and beyond.